Tom Tancredo is always comfortable in front of a microphone, even when his words are making his audience uncomfortable. That’s exactly what the most prominent Republican to endorse Walker Stapleton did July 30 at the Jefferson County Republican Men’s club, when he delivered racist comments about black student athletes at his alma mater, Northeastern Junior College. The anti-immigrant firebrand’s influence with the GOP base is exactly why Stapleton asked the conservative icon to introduce and nominate him at the Republican state assembly. That said, Tancredo’s remark about the Klan’s relaxed racial quota when it came to black athletes fell flat on the conservative audience, which appeared to be shocked by the comment. In Tancredo’s other roles, including frontman for an anti-immigrant 501c4 nonprofit, occasional radio host, and social media personality, his continual race-baiting and sometimes flat-out racist statements fall on generally friendly ears. 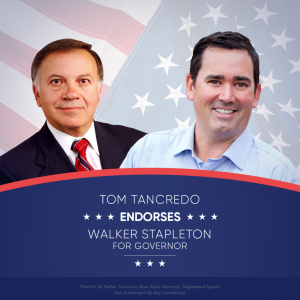 Ever since Walker Stapleton used Tancredo’s name and brand to secure the Republican nomination however, pundits have noted that ultra-conservative firepower that proved so useful before the primary will likely become a liability in November. In his speech nominating Walker Stapleton to Colorado Republicans at the state assembly in April, Tancredo gave two reasons for his presence. If Tancredo continues to make blatantly racist statements in public and the pundits are correct, then some people will indeed have their heads in their hands November 7, just not the ones Tancredo is thinking of. Why would the campaign send Tancredo rather than having Stapleton, Sais (whose district covers some of JeffCo), or some currently elected politician? Someone from JeffCo? Someone who has been a consistent Republican for the past decade rather than jumping in as American Constitutional Party nominee or as an independent? And if it has to be Tancredo, why let him loose without an approved script? Why is Tancredo pushing a 30-some year old book and its statistics? Shouldn't the campaign invest in a college intern as a researcher and get something a bit more current? Losing Ground came out in the Reagan era — and although odious, it triggered changes in "welfare" in the 1990s under Clinton and the Republicans in Congress. Things have changed, and I'd bet even JeffCo Republican men under 60 know it. And … so many questions about the Stapleton campaign's readiness for prime time. Stapler's campaign, taking a page from Zen Buddhism, is practicing the competence of no-competence. Actually some of those stats he was reciting were published in the late '60's or early '70's by the great conservative Daniel Patrick Moynihan. Like Moderatus, Tancredo was cryogenically frozen circa 1978 and has only recently been thawed out. You are correct about getting someone else to do the speaking, or at least put together a script that was properly vetted. Somebody needs to pin that good ol' boy down. Just ask him to his face in front of a crowd, "Do you think that the white race is endangered? Is that why you're recommending the Charles Murray book? And if you do feel that the white race is endangered, what is your plan to "protect" it? Tancredo, who nominated you said (any number of stupid, racist things). What is your opinion of those statements? Why have you chosen this man to endorse you? Have you read this book "Losing Ground" that Tancredo is promoting? Do you believe that the white race is "losing ground"? Well, what do you plan to do about it?"